Night Witches is one of those plays that is so well written that it draws you in immediately and refuses to let go until it has taken what it wants. The creativity and passion of its seven creators is obvious and should carry it far beyond its current incarnation... Moments of terror and joy are dispersed throughout and superbly acted." ... We were taken by the austerity of the set, so very fitting to the circumstances of the situation and the women you portrayed... truly conveyed the courage, the dedication to cause and the compassion they held for each other necessary for them to prevail against the terrible circumstances." An astonishing feat of storytelling, movement, music, and history! The ensemble of Night Witches gives this performance everything they’ve got: their energy is infectious..."
Night Witches blasts away the conventional women's wartime stories with a historical tale familiar in its setting but brave in its power. Night Witches plants its feet so firmly in its own ramshackle world that even the low-budget trappings of the production feel like we're living in a unit made up of second-hand gear, like the 588th really were. The acting is rock-solid... it has the potential to soar as high as any one of its airborne heroines." 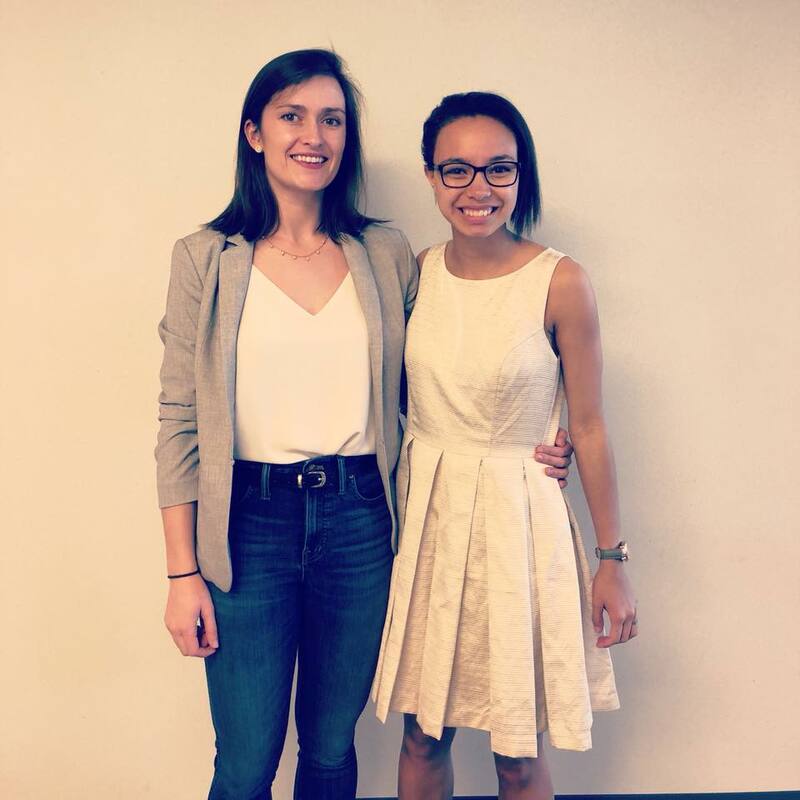 Our Executive Producer/Director, Elena Kritter with JMU student, Yasmine Vaughan at her thesis presentation - "Bomb-Dropping Bombshells: An Analysis of the Motivations and Accomplishments of the All-Female 46th Taman Guards Bomber Aviation Regiment." In the midst of writing her thesis, Yasmine found us/Night Witches online. We were happy to visit JMU to show our support and share a little bit about our production, history, and research. To read Yasmine's complete thesis, please visit the link below.